For fighter info, see Duck Hunt (SSB4) and Duck Hunt (SSBU). For other uses, see Duck Hunt (disambiguation). 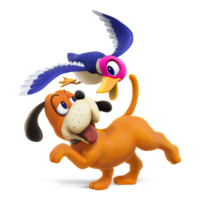 Official artwork of the dog and a duck as they appear in the Japanese and European cover of Duck Hunt. Duck Hunt (ダックハント, Duckhunt), known in PAL regions as Duck Hunt Duo, is the name of a playable tag team composed of the hunting dog and a duck from the NES light gun game, Duck Hunt. Throughout Duck Hunt, the goal is to shoot all of the ducks with a limited amount of bullets and time. By plugging a controller into the player 2 slot in the NES, a duck can be controlled to a limited extent by another player. The hunter is the playable character in all versions of Duck Hunt and is supposed to represent the player. Accompanying the player is a non-playable scent hound, who flushes out the ducks for the hunter to shoot and picks up any ducks that are shot down by the player. If the player fails to shoot down any ducks, the dog infamously laughs at the player's misfortune before slinking back down into the grass. Although the home console version of Duck Hunt does not allow players to shoot the dog, the arcade version, Vs. Duck Hunt, actually allows players to do so in the bonus rounds. However, successfully shooting the dog immediately ends the bonus round and yields no points. Super Smash Bros. Melee marks the debut of the Duck Hunt universe within the Super Smash Bros. series. The universe is represented by a collectible trophy that consists of two ducks, and its description references both the hunting dog and the player as the hunter. A concept similar to Assist Trophies was considered for Melee, with one example being the ducks from Duck Hunt flying around the stage and interfering with characters. However, the idea was scrapped due to developmental circumstances. The Ducks trophy in Melee. These friendly fowl are the targets in the game Duck Hunt, which utilizes the Nintendo Zapper Light Gun. They appear and randomly fly about trying to escape after your faithful (if slightly clamorous) hunting dog flushes them out. Once you drop the ducks, your dog dutifully fetches them by the napes of their necks and grins at you. Super Smash Bros. Brawl marks the second appearance of the Duck Hunt universe. Instead of a trophy, the universe is represented with a sticker of a duck. Fittingly, the sticker can only be applied to the Ice Climbers, Mr. Game & Watch, Pit and R.O.B., all of whom debuted in the 1980s like the hunting dog and ducks. Duck Duck Hunt SpecialLaunchResistance+020 +20 Ice Climbers Mr. Game & Watch Pit R.O.B. Duck Hunt, as they appear in Super Smash Bros. 4. Super Smash Bros. 4 marks both the third appearance of the Duck Hunt universe, and the debut of unlockable representatives for said universe. Masahiro Sakurai stated that the inclusion of playable Duck Hunt representatives was influenced by that respective game's worldwide sales numbers, and his feeling that the Duck Hunt universe had not been viable for such representation until SSB4. 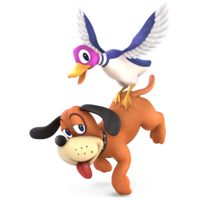 Like the Ice Climber universe, the Duck Hunt universe's playable representatives (the hunting dog and a duck) function as a tag team that is referred to by their home game's name. Duck Hunt were the final newcomers to be officially revealed. Three of Duck Hunt's special moves also reference other "Light Gun Series" games contemporary to their home game. Their neutral special involves a tin can from the "Trick Shot" game mode from Hogan's Alley; their down special involves the gunmen from the NES game Wild Gunman; and their Final Smash collectively involves a flock of ducks from Duck Hunt, the cardboard cutouts from the Hogan's Alley, and the gunmen from Wild Gunmen. Outside of these moves, their smash attacks also make use of the NES Zapper. Duck Hunt are currently ranked 30th out of 55 on the tier list, placing them at the top of the D tier, and rendering them the highest ranking mid-tier characters. Duck Hunt's projectiles make them capable at stage control and zoning, with Trick Shot being the most useful due to its remote controllable property. They also have a good air game, as their sweetspotted neutral aerial, up aerial and sweetspotted back aerial are capable KOing options, while their forward aerial is useful for edge-guarding and spacing. However, their KO potential is very inconsistent, due to having a very small number of KOing options and because of their smash attacks' very awkward hitbox placements making them liable to fail at landing all of their hits. Although Duck Jump is a maneuverable recovery move that grants a decent amount of vertical and horizontal distance, it is slow and unprotected, which leaves Duck Hunt wide open to edge-guarding and forces them to use the dog's wall jump more often than not. Their reliance on projectiles is also highly ineffective against characters who can counteract them, such as those with reflectors and especially against Rosalina & Luma, who can completely nullify their projectiles with Gravitational Pull. Despite having a small playerbase, Duck Hunt have nevertheless managed to achieve decent results at regional and national tournaments, thanks to Raito, Brood, You3, ImHip and Dandy Penguin. You could call these two the stars of the NES 1985 launch title Duck Hunt. The goofy dog would chase down any ducks hit by the Zapper. In Smash Bros., these two work as a team to fight. When a can or a clay pigeon is in play, hit the button again to fire at it. Show your foes how the ducks felt! Back in 1987, when Duck Hunt came out, these two might not have had the best relationship. That all seems to have changed now, and this unlikely pair are here to fight together. After throwing a can or a clay pigeon, press the button again to have a little helper fire the NES Zapper for extra damage! Duck Jump, an up special, has the charming twosome float up in an adorable fashion. It also makes getting back to the stage much easier. Their side smash can hit up to three times at close range, depending on your shooting skills. By charging up the attack, you can increase the range even further! Duck Jump Duo, an up special, has the charming twosome float up in an adorable fashion. It also makes getting back to the stage much easier. Their side smash can hit up to three times at close range, depending on your shooting skills, and by charging up the attack, you can increase the range even further! In the NES game Duck Hunt, the dog is your trusty hunting partner. He scares the ducks and then picks up the ones you hit. If you don't hit any, though, he'll laugh at you. So much for man's best friend... In the Duck Hunt stage in this game, he'll occasionally pop up in his 8-bit glory and let you use him as a platform! In the classic NES game Duck Hunt, you hunt, er...ducks. The dog flushes them into the air, and then you aim and fire. Taking down ducks gets you points in the Duck Hunt stage in this game too. It has no effect on the battle, but the alternative Duck Hunt action might be a refreshing change from constantly punching your friends in the face. Duck Hunt, as they appear in Super Smash Bros. Ultimate. Duck Hunt return as unlockable characters in Super Smash Bros. Ultimate. Duck Hunt has been given a mix of buffs and nerfs from the transition to Ultimate. Duck Hunt's notoriously mediocre KO power in SSB4 has been improved in many ways: dash attack, forward- and down tilts all have more knockback, while their infamously unreliable smash attacks now connect more reliably (though the final hit may still fail to connect in some instances) and have more knockback. In addition, Trick Shot, which was already a powerful, versatile projectile, has been improved in many ways: it KOs earlier, travels further, has less endlag and can now be hit in air, increasing it's utility even further. In addition, Wild Gunman also deal more knockback, with orange and sombrero Gunmen being able to KO at realistic percents. However, the changes have resulted in very low tournament representation in early metagame of Ultimate, especially outside of Japan, with even some notable Duck Hunt players in SSB4 having completely dropped the character. Due to Duck Hunt's lack of representation in tournaments, their true viability remains to be seen. The dog, Palutena, Ridley, Dark Samus, Piranha Plant, and Wii Fit Trainer are the only playable characters in the Super Smash Bros. series that do not have a playable appearance in any other video game. The dog is the fourth playable canid character after Fox McCloud, Wolf O'Donnell and Lucario. He is also the second quadrupedal character after Ivysaur. In comparison, the duck is the third playable avian character after Falco Lombardi and King Dedede. This page was last edited on April 14, 2019, at 00:14.